Dazu Huike (487-593) (Chinese: 大祖慧可; Chinese for short:慧可; pinyin: Huìkě; Wade-Giles: Hui-k’o; Japanese: Eka) is considered the Second Patriarch of Chinese Ch'an Buddhism and the twenty-ninth after Gautama Buddha. He received the symbolic robe and bowl of dharma succession from Bodhidharma, the First Patriarch of Ch’an. Little factual information is available about the lives of Bodhidharma and Huike; accounts of them in historical texts are semi-legendary. Huike is known for cutting off his left arm and presenting it to Bodhidharma to demonstrate his sincerity after Bodhidharma initially rejected him as a student. Four springs (called Spring Zhuoxi) in front of the Second Ancestor's Monastery built for Huike at the Shaolin Temple in Henan are said to have been created by Bodhidharma so that Huike could easily fetch water with only one arm. One of the most important characteristics of the early Ch'an of Bodhidharma and Huike was the concept of sudden enlightenment rather than the Indian yogic meditation which advocated concentration and gradual self-perfection as the means to enlightenment. Ch’an emphasized that Buddha Nature was within, and that each person must realize this individually through meditation rather than through studying the sutras, performing ceremonies, doing good deeds or worshiping the Buddhas. Both Huike and Bodhidharma are said to have based their teachings on the Lankavatara Sutra, which urges "self-enlightenment," the “forgetting of words and thoughts.” There is little doubt that Huike practiced and promoted meditation as the method to reach a true understanding of Buddhism, and that he taught that meditation should be free of any dualism or attachment. Dazu Huike (487-593) was the second of the almost-legendary early Ch'an patriarchs in China. Little historical data is available about their lives, and traditional biographies, developed over the centuries, are representations of Ch'an mythology rather than factual histories. The earliest extant biography of the Ch'an patriarchs is the Biographies of Eminent Monks (519) (Chinese:高僧, Wade-Giles: Kao-seng chuan) and its sequel, Further Biographies of Eminent Monks (Xù gāosēng zhuàn, Chinese:隋高僧傳 Wade-Giles: Hsu kao-seng chuan; Japanese: Zoku kosoden) (645) by Daoxuan (道宣; 596-667). The biography given here is the traditional Chan biography repeated in numerous sources over the centuries, including the Transmission of the Lamp (Denkoroku), by Keizan Jokin Zenji (1268-1325), a koan collection of 53 enlightenment stories based on the traditional legendary accounts of the Zen transmission between successive masters and disciples in the Soto Zen Buddhist lineage from Shakyamuni Buddha to Japanese Zen Master Ejo, who first brought the Soto Zen teaching from China to Japan. According to the Hsu kao-seng chuan, Huike was born in Hu-lao (Ssu-shui hsien, Henan) and his secular name was Shen-kuang (Japanese: Shinko). A scholar of both Buddhist scriptures and classical Chinese texts, including Daoist works, Huike was considered enlightened but was criticized for not having a teacher. He met his teacher Bodhidharma, the First Patriarch of Chán at the Shaolin Monastery in 528 when he was about forty years old. Bodhidharma, a South Indian monk, is traditionally credited as the transmitter of Zen to China. Legend says that when Huike initially asked Bodhidharma to teach him, Bodhidharma turned him away. Huike stood in the snow outside Bodhidharma’s cave all night until the snow reached his waist. In the morning Bodhidharma asked him why he was there. Huike replied that he wanted a teacher to "open the gate of the elixir or universal compassion to liberate all beings." Bodhidharma again refused, saying, “how can you hope for true religion with little virtue, little wisdom, a shallow heart, and an arrogant mind? It would just be a waste of effort.” Finally, to prove his resolve, Huike cut off his left arm and presented it to the First Patriarch as a token of his sincerity. Bodhidharma accepted him as a student and changed his name from Shenguang to Huike (“Wisdom and Capacity”). Huike studied with Bodhidharma for six years (some sources say four years, five years, or nine years). Bodhidharma passed on the symbolic robe and bowl of dharma succession to Huike and, some texts claim, a copy of the Lankavatara Sutra. Bodhidharma then either returned to India or died. In Further Biographies of Eminent Monks, Daoxuan writes that Bodhidharma died at the banks of the Luo River, where he was interred by his disciple Huike, possibly in a cave. Huike went to Yedu (Wade-Giles: Yeh-tu) (modern Henan) around 534 and, except for a period of political turmoil and Buddhist persecution in 574, lived in the area of Yedu and Wei (modern Hebei) for the rest of his life. During the time of upheaval Huike sought refuge in the mountains near the Yangtze River and met Sengcan who became his successor and the Third Chinese Patriarch of Ch'an. In 579, Huike returned to Yedu and expounded the dharma, drawing large numbers to listen to his teachings and arousing the hostility of other Buddhist teachers. One of them, Tao-heng, paid money to have Huike killed but Huike converted his would-be assassin. The Wudeng Huiyan (Compendium of Five Lamps) compiled by Dachuan Lingyin Puji (1179-1253) claims that Huike lived to the age of 107. He was buried approximately forty kilometers east northeast of Anyang City in Hebei Province. Later, the Tang Dynasty emperor Dezong gave Huike the honorific name Dazu (“Great Ancestor”) Some traditions relate that Huike was executed after influential Buddhist priests complained about his teachings. According to one story, instead of blood, a white milky substance flowed from his neck after he was decapitated. The Second Ancestor's Monastery at the Shaolin Temple on Mount Song (Song Shan) in Henan was built for Huike. In front of the monastery are four springs called "Spring Zhuoxi," said to have been created by Bodhidharma so that Huike could easily fetch water with only one arm; each spring has its own distinctive flavor. The traditional accounts of Huike and his teacher Bodhidharma are typically expressions of the principles of Ch’an Buddhism. One of the most important characteristics of the early Ch'an of Bodhidharma and Huike was the concept of sudden approach to enlightenment rather than the Indian yogic meditation which advocated concentration and gradual self-perfection. Ch’an de-emphasizes theoretical knowledge and the study of religious texts in favor of experiential wisdom, particularly as realized in meditation and dharma practice. The Laṅkāvatāra Sūtra is among the first and most important texts in the Yogācāra, or "Consciousness-only," school of Mahāyāna Buddhism. It is a "difficult and obscure" text emphasizing "the inner enlightenment that does away with all duality and is raised above all distinctions". The sutra urges "self-enlightenment," the “forgetting of words and thoughts.” There is little doubt that Huike practiced and promoted meditation as the method to reach a true understanding of Buddhism. In his Further Biographies of Eminent Monks (Chinese: 高僧傳 Wade-Giles: Hsu kao-seng chuan; Japanese: Zokuk kosoden), Daoxuan listed Huike and his circle of disciples as masters of meditation (dhyana masters; Wade-Giles: ch’an-shih; Japanese: zenji), highlighting the importance of meditation practice in the early years of Ch'an development. 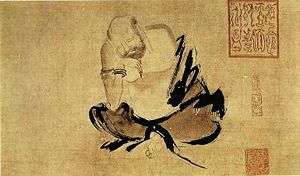 The form taken by Huike and Bodhidharma’s meditation, which Daoxuan labeled ju shih an-hsin wei pi-kuan (“wall gazing” or “wall contemplation”), is unclear. The Treatise on the Two Entrances and Four Practices (Wade-Giles: Erh-ju ssu-hsing lun; Pinyin: Erru sixing lun), attributed to Bodhidharma refers to two "entrances," the "entrance" of principle and the "entrance" of practice. The entrance of principle is faith that the teachings are true and that everyone possesses the same “true nature” which is covered up by “false senses.” The entrance of practice refers to the four practices of the title: Be undisturbed by suffering, accept one’s circumstances and be unmoved by good or bad fortune, be without attachment or desire and, finally, govern one’s actions based on understanding the emptiness or non-substantiality of all things. Ignorance and wisdom are identical, not different. ↑ Heinrich Dumoulin, "Early Chinese Zen Reexamined: A Supplement to Zen Buddhism: A History," Japanese Journal of Religious Studies 20 (1993) (1): 31–53. ↑ John R. McRae, Seeing Through Zen: Encounter, Transformation, and Genealogy in Chinese Chan Buddhism (University of California Press, 2003, ISBN 0-520-23798-6), 5. ↑ Philip Yampolsky, Ch’an, a Historical Sketch in Buddhist Spirituality in Later China, Korea, Japan and the Modern World, edited by Takeuchi Yoshinori (SCM Press, 1999, ISBN 0-334-02779-9), 5. ↑ 4.0 4.1 Thomas Cleary, Transmission of Light: Zen in the Art of Enlightenment by Zen Master Keizan (North Point Press, 1999, ISBN 0-86547-433-8), 126. ↑ John McRae, Further Biographies of Eminent Monks (University of Hawaii Press, 1986, ISBN 0-8248-1056-2p 24; Dumoulin, Heinrich, Zen Buddhism: a history, India and China, Macmillan Publishing, 1994,1998. ISBN 0-02-897109-4), 88. ↑ Bernard Faure, Bodhidharma as Textual and Religious Paradigm in History of Religions 25 (3) (Feb., 1986): 187-198. ↑ John McRae, The Northern School and the Formation of Early Ch’an Buddhism (University of Hawaii Press, 1986, ISBN 0-8248-1056-2), 22. ↑ Andy Ferguson, Zen’s Chinese Heritage: The Masters and Their Teachings (Wisdom Publications, 2000, ISBN 0-86171-163-7), 492. ↑ Micahel H. Kohn (ed. ), The Shambhala Dictionary of Buddhism and Zen (Shambhala, 1991, ISBN 0-87773-520-4), 94. ↑ Andy Ferguson, Zen’s Chinese Heritage: The Masters and Their Teachings (Wisdom Publications, 2000, ISBN 0-86171-163-7), 20. ↑ Jeffrey L. Broughton, The Bodhidharma Anthology: The Earliest Records of Zen (Berkeley: University of California Press, 1999, ISBN 0-520-21972-4), 62. ↑ Florin Giripescu Sutton, Existence and Enlightenment in the Laṅkāvatāra Sūtra: A Study in the Ontology and Epistemology of the Yogācāra School of Mahāyāna Buddhism (Albany, NY: State University of New York Press, 1991, ISBN 0-7914-0172-3). ↑ D. T. Suzuki (ed. ), [http://lirs.ru/do/lanka_eng/lanka-nondiacritical.htm Preface, The Lankavatara Sutra: A Mahayana Text. Retrieved December 8, 2008. ↑ Michael H. Kohn (ed. ), The Shambhala Dictionary of Buddhism and Zen (Boston, 1991), 125. Broughton, Jeffrey L. The Bodhidharma Anthology: The Earliest Records of Zen. Berkeley: University of California Press, 1999. ISBN 0-520-21972-4. Cleary, Thomas. Transmission of Light: Zen in the Art of Enlightenment. North Point Press, 1999. ISBN 0-86547-433-8. Dumoulin, Heinrich. Zen Buddhism: A History, India and China. Macmillan Publishing, 1998. ISBN 0-02-897109-4. Dumoulin, Heinrich. "Early Chinese Zen Reexamined: A Supplement to Zen Buddhism: A History." Japanese Journal of Religious Studies. 20 (1) (1993): 31–53, ISSN 0304-1042. Retrieved December 8, 2008. Ferguson, Andy. Zen’s Chinese Heritage: The Masters and Their Teachings. Wisdom Publications, 2000. ISBN 0-86171-163-7. Maguire, Jack. Essential Buddhism. New York: Pocket Books, 2001. ISBN 0-671-04188-6. McRae, John. The Northern School and the Formation of Early Ch’an Buddhism. University of Hawaii Press, 1986. ISBN 0-8248-1056-2. Kohn, Micahel H. (ed.). The Shambhala Dictionary of Buddhism and Zen. Shambhala, 1991. ISBN 0-87773-520-4. Suzuki, D.T. Essays in Zen Buddhism. New York: Grove Press, 1949. ISBN 0-8021-5118-3. Watts, Alan. The Way of Zen. New York: Vintage Books, 1985. ISBN 0-375-70510-4. Yampolsky, Philip. Ch’an, a Historical Sketch in Buddhist Spirituality in Later China, Korea, Japan and the Modern World. Edited by Takeuchi Yoshinori. SCM Press, 1999. ISBN 0-334-02779-9. Zvelebil, Kamil V. 1987. "The Sound of the One Hand." Journal of the American Oriental Society. 107 (1): 125–126. This page was last modified on 9 November 2017, at 15:59.